Swell:Open Faced Sandwich is so huge that I couldn't fit it into my scanner. Swell is the story of Emmeline and Lucy - both of whom are at a point of change in life. Emmeline goes away to university and Lucy... well, Lucy just goes. Despite the oversized pages, Julia still struggles with holding her thoughts and visions to these pages. Each page and panel is a kaleidoscope of shapes, patterns, and angles. Borders surround the panels and inside the borders images shift and undulate as Emmeline's emotions swell. Over 22 pages, nothing is stable, but you also aren't able to take your eyes off of Julia's art. 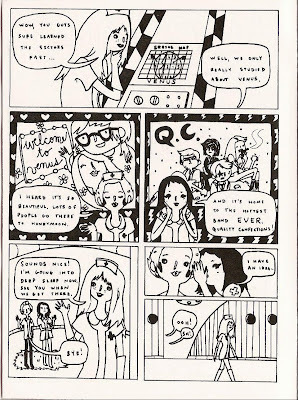 Swell debuted at SPX 2007 as the first part of a longer story. 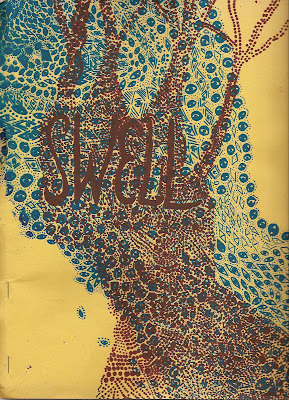 Here's another image from Swell scanned properly from a website. Julia's current website, Juliacks is still under construction, but you can get some good info on her work here. 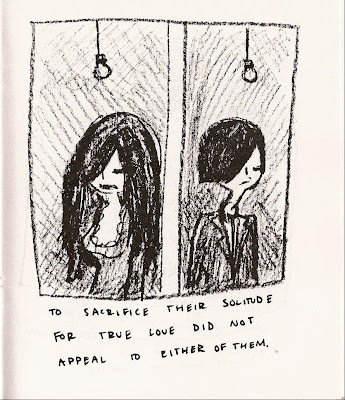 Antelope Eater is a 20 page mini-comic based on a performance. Julia captures the tale of Andy Yak who can't accept that his mother is dying. Andy escapes and becomes the Antelope Eater. This mini is much more cotrolled than Swell or Old Lady Merrell. Page borders are wider and the story seems more contained, despite the constant presence of geometric shapes, swirling patterns, and dying cells. The Tale of Old Lady Merrell is an engaging and visually exciting book. Julia mixes different types of art (watercolor, pen and ink, lithography) over the course of this tale and begins with these jagged words scratched into a black page: "The decaying house was contaminated. Each room was filled with mounds of what some call junk and others call antique." Old Lady Merrell's house may be disgusting to outsiders, but it's her home. To fill her empty life, she has created dolls that mean something dear to her, while outsiders find the dolls frightening. When her house is marked for destruction by the county, all she can think about is saving her dolls. This is a very moving story and it fits that this book was born out of a performance. Julia packs these pages with little details that make the story more lifelike. An uptight county inspector becomes a rooster in mid-sentence. A pair of girls are frightened by Old Lady Merrell's upstairs doll room and you can see the tension around the eyes of one of the girls as she tentatively grasps the hands of her companion. When the unfortunate old woman decides on the course she must take, the pace of the narrative speeds up noticeably. At the same time, the selective use of color gives the story punch and emotion. 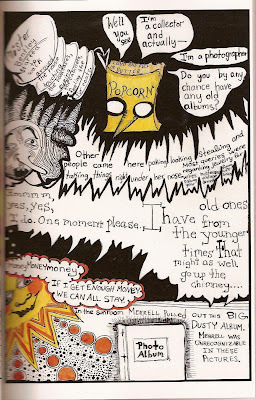 The Tale of Old Lady Merrell is a 68 page book with about a third of the pages in full color. You can get your copy at Lulu.com for $15.98 or download it for a ridiculously cheap $1.25. I would suggest getting the book to capture the intensity and feeling of the story. 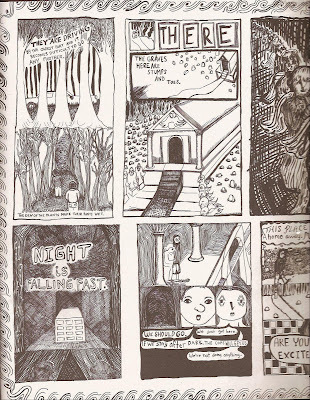 You can also grab Julia's work, at least Swell, from Pittsburgh-based Copacetic Comics. Go get your $2 copy of the 11" X 11" Swell for the best buy in mini-comics I've seen in quite some time. 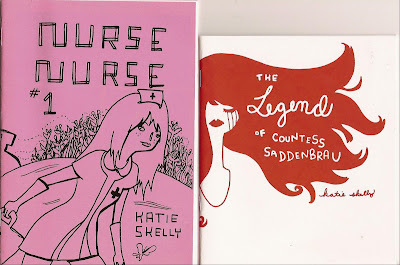 Two Mini-Comics from Katie Skelly The Legend of Countess Saddenbrau, perhaps the most aptly named mini of last year, and Nurse Nurse from Katie Skelly are fun mini-comics. Countess Saddenbrau pokes fun at the gothier than goth sect in a gentle manner. Countess Saddenbrau and Duke Crestfallen, both very happy wallowing in their own solitude, stumble upon each other and find that they must act upon their feelings for each other. But would they be happy together when both so enjoy their time alone? Hmmm, probably not. Katie's art for the The Legend of Countess Saddenbrau perfectly matches the setting and action of her tale. 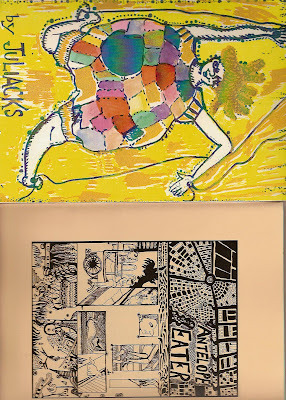 She uses crayon reproduced on a xerox machine to lend it that darker than thou look. Nurse Nurse has a lighter feel and a more expansive topic. In the year 3030, three cosmic nurses travel to Venus, home of the hippest intergalactic band, the Quality Confections. Nurse Gemma, the star of the mini, is tricked by her two friends and ends up arriving late on Venus. Then Gemma is assigned to the case of a butterfly farmer where things end up on the sinister side as the mini closes. This is one of those endings where you immediately want to know what happens next. Nurse Nurse feels kind of manga influenced, though not in art so much as in content. Both minis are $3 from Katie's Etsy shop. I'm not sure when Nurse Nurse #2 is coming out, but she needs to get on that. 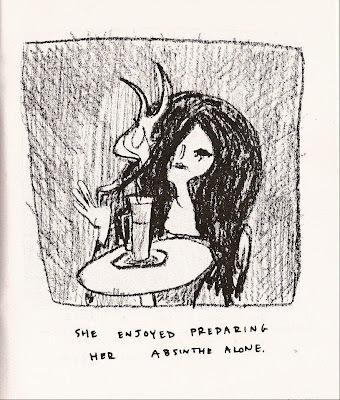 In the meantime, you can check out some of Katie's comics online at her website.